This feature is killer and it’s been waited for long time by any developer or company who use EF visual models with a lot of entities. Think about a model where you have hundreds of entities.., opening a single diagram with 200 entities doesn’t make sense and it is too slow and kind of unmanageable. 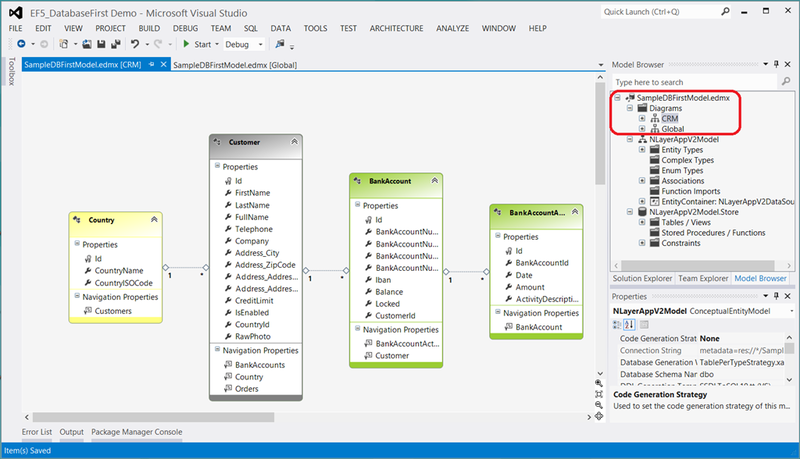 Now, with EF 5.0 and Visual Studio 2012, you can have many diagrams that visually Split the same entity model. This is cool, even more than the coloring feature. You can also do it in a COPY/PASTE way. so, any entity can be showed in several diagrams, etc. I want to highlight that both diagrams are like a VIEW of the same MODEL, which has all the entities. A given MODEL (.edmx) can have now many visual DIAGRAMS. This is really convenient for visually isolating certain areas of high complex and large models.